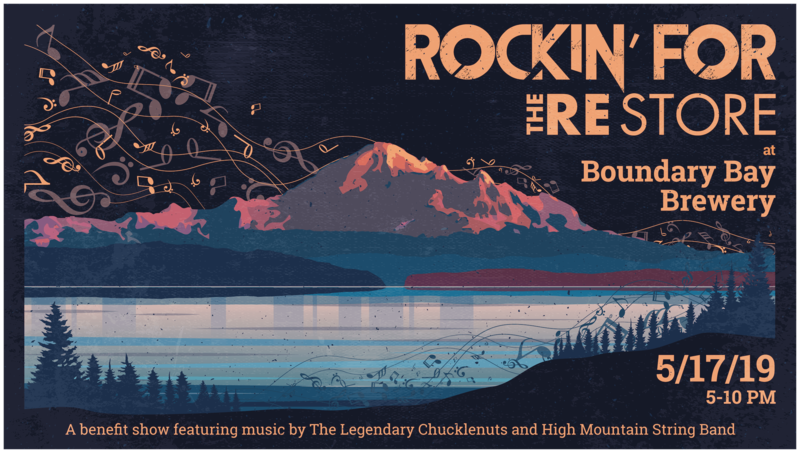 We are excited to announce that we’ll be holding our 3rd annual Rockin’ for The RE Store fundraiser on May 17th at Boundary Bay Brewery’s outdoor beer garden. The evening will feature a raffle, silent auction, and performances by The Legendary Chucklenuts and High Mountain String Band. All proceeds from the evening go to support our Community Jobs Training program, which provides free job training to displaced workers. Visit our Community Job Training page to learn more. In the past two years, Rockin’ for The RE Store has raised nearly $25,000 for job training opportunities for the underserved and at-risk in Whatcom County. With help from the community, we’ve been able to provide 50 low-income individuals with an average of 300 hours of one-on-one workplace training that prepares them for long-term, meaningful employment. By partnering with local social justice organizations to ensure training curricula is focused on real-world in-demand skills, we have has seen more than 80% of trainees successfully integrate into the local job market. Derek’s story offers a window into just how transformational job training can be. Recently out of prison, Derek was looking for a chance to change his life for the better. In 2017, Derek came to The RE Store as a volunteer and started as a trainee through a WorkSource placement a year later. During his 7 months training program, Derek demonstrated the utmost professionalism, a kind-hearted nature, and a deep commitment to the mission of the RE Store, his co-workers and the satisfaction of our customers. When a position became available, we were honored to bring Derek on board as a Salvage crew member. We’ve set a goal of $20,000 for Rockin’ for The RE Store to ensure that trainees like Derek can continue to succeed in their career goals. We have a program that works – but we can’t do it alone. You can help by purchasing a $5 raffle ticket, showing up at Rockin’ for The RE Store at Boundary Bay Brewery on May 17th from 5pm-10pm or by donating to help us reach our goal. Raffle tickets are $5 and can be purchased at The RE Store (where Meridian intersects with Broadway Street) April 10 – May 16. A raffle ticket will put you in the running to win one of our amazing raffle prizes, including: dinner and lodging for two at The Willows Inn on Lummi Island, a fully outfitted Marin Fairfax commuter bike with fenders, lights, rack and a lock, or a date night package of a night’s stay at Heliotrope Hotel, a show with prime seats at Mount Baker Theater and dinner at Brandywine Kitchen. Visit The RE Store at 2309 Meridian Street in Bellingham to purchase a raffle ticket today, and save the date for May 17.